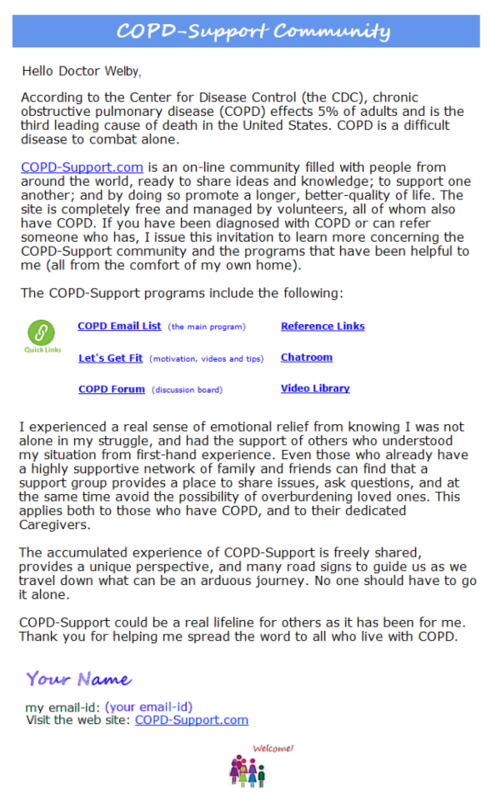 If you believe in COPD-Support as we do, you may also wish to share it with others. The letter is appropriate for any other COPDer, Caregiver, and healthcare providers such as nurses, rehabilitation therapists, psychosocial staff, dietitians, and especially your Doctor(s) who have the ability to recommend COPD-Support to their patients. If you don't have an email address to send to, you can print the letter out, then hand-deliver or use snail mail, but email is best so the receiver can have the easy access of the COPD-Support links, which are omitted when printing. Our goal is to reach as many of the millions of others also diagnosed with COPD as we possibly can. We appreciate your endorsement; thank you! We also have a small brochure (takes one sheet of paper) you can print out.